You could hire the best writer to create compelling, conversion-optimized text for your website. But if no one is reading it, then no one is being compelled – or converted. Overall, people don’t read anymore – but you already knew that, right? They land on a web page and visually scan it. If nothing really jumps out at them, they reach for the back button. You’ve done it a million times. Despite that company’s significant investment in SEO to get you to that page, plus the cost of professional design and writing, visitors keep landing on their site and quickly bouncing off. Why? Good question. To answer it, we need to look at where the disciplines of design and copy overlap. I call that Content Presentation, and it’s about using design not just to make the site look nice, but to draw the scanning eye to key messages, and then deeper into the site. So it’s not just about how copy is written. It’s also about how it’s presented. But first, follow me, if you will, on a shopping trip. Now we’re walking into a store, let’s say Bed Bath & Beyond. Not sure why I chose that particular retailer, but they seem to fit our purposes. Okay, so as you walk in, and you’re confronted by all kinds of different stuff on display. Your eye scans the overall scene at first, until you notice those colorful throw pillows. You walk over and focus your attention on them, maybe touching the fabric or checking the price. Nice, but you don’t actually need throw pillows. So you go back to scanning the shelves, until that cool ultra-modern soap dispenser catches your eye. After focusing on it for a moment, you go back to doing the scan thing. Scan-and-focus. Scan-and-focus. Humans go into that alternating-attention mode in lots of different circumstances. For example, when we visit a web page. The ‘content tip’ here is to build web pages that cater to the scan-and-focus habit. And of course what you want folks to focus on are your company’s key selling messages. Let’s start with where your eye first lands on a web page. From there, left to its own devices, the eye generally continues down and to the right. But of course it’ll depend on the structure of the page. We’ve been taught that the eye moves in an “F” pattern – mostly across the top and down the left edge. But that only really applies to list-based pages, like Google search results. It’s important to note that any text that begins far from that center of gravity, specifically at the left edge of the page, is at risk of being missed completely. As the eye rambles down the middle of the page, asking it to make a sharp right turn all the way to the left edge is, surprisingly, asking a lot. So adding a little extra ‘air’ or space along that left edge will bring the first words closer to the eye’s natural path. Adding a little air above text is important too. If the copy is too close to say, the large photo above it, it’s in essence visually buried. After looking at the photo, the eye might just fly over that chunk of content as it meanders down the page. All those great product or service benefits, so artfully described using your best content tips, aren’t even being noticed. Pity. On the other hand, in a carefully balanced layout, photos and icons can capture the eye and deliver it to an important copy point that otherwise might not have gotten attention. Also, note that we tend to notice things that are larger, more colorful, or offer more contrast from the background. Knowing this, we can get folks to focus their attention on the most important elements we want them to see. In a web universe of short attention spans, even little missteps can send your visitor reaching for the Back Button. What are some other ways to lose your visitor forever? Long paragraphs are a real killer. On the web, there shouldn’t be more than two or three sentences to a paragraph. And to keep people engaged, insert an enticingly-worded header every couple of paragraphs. Or, make the first few words of alternating paragraphs bold, to draw in the eye as it rambles down the page. Also, it turns out that there’s a vast gulf between the last word of a headline, and the first word of text. A lot more people are reading that headline than reading the text. That’s so sad to me. But I fight back, and my weapon is the subhead. That secondary headline placed between the main headline and the text acts as a kind of bridge or visual funnel, gently guiding the eye deeper into the copy. Do you have you have your menu and dropdowns all carefully arranged? Great. Problem is, only your most motivated web visitors are clicking on those tiny menu links. That’s why it’s important to include, especially on the Home page, prominent links, with a bit of ‘teaser’ copy, to the pages you most want buyers to see. Text formatting counts more than we realize. The text that will be easier to read (and therefore more likely to be read) if it is: in a shorter column vs. a full-width column; in a larger rather than smaller font; and with looser rather than tight line-spacing. The truth is, even these days, people do read. They read all the time. They just might not read the content on a particular site, because during the website development process, there was more focus on making it looking nice than on making it inviting to read. Anyway, those are content tips that have a lot more to do with how the copy is presented than how the copy is written. If you don’t manage to engage the eye, it doesn’t really matter what those words say. 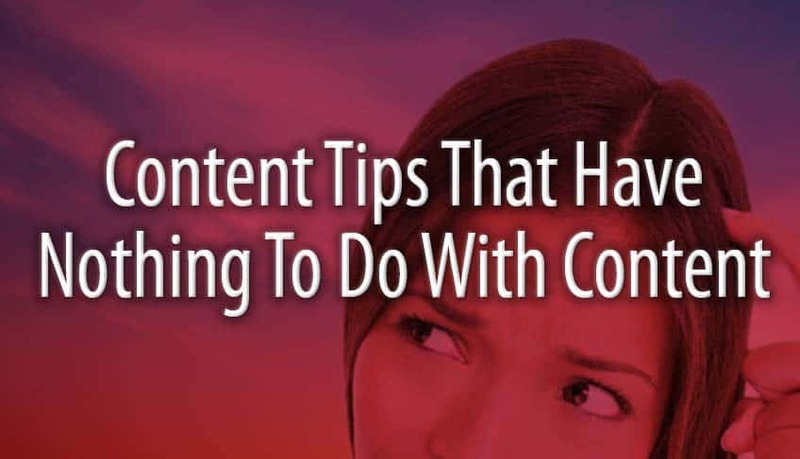 For content tips that actually have something to do with content, check out An Atlanta Copywriter Shares 3 Surprising Secrets.